You know, even when you’re eating right and watching your weight, sometimes a person just NEEDS dessert. Or something akin to it. This parfait fits the bill. I had noticed that the new yogurt flavors looked so exotic, and I decided to toss a few flavors into my cart while at the grocery. 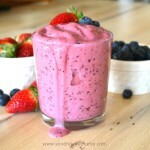 Make sure you scroll down to get my recipe! My go-to flavor is strawberry, but I also picked up a few unique flavors – I’ve never had caramel favored yogurt before. 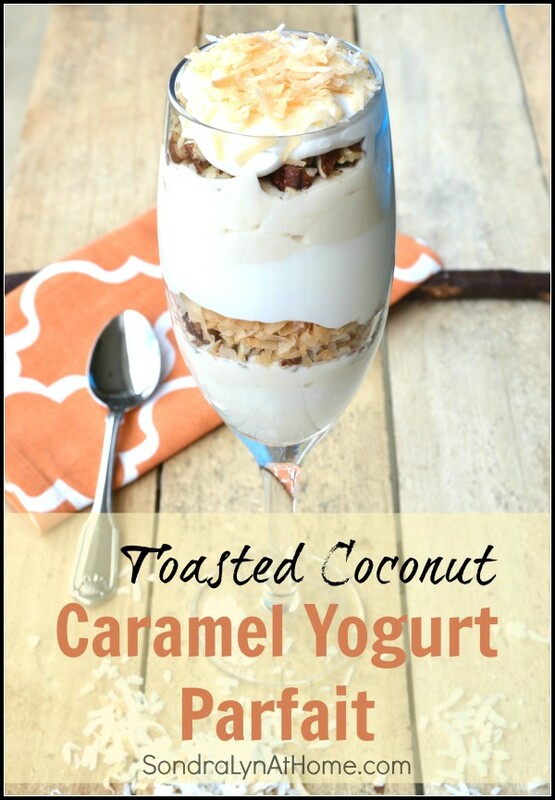 I love the flavor combination of toasted coconut and caramel, so I developed thisToasted Coconut Caramel Yogurt Parfait Recipe. 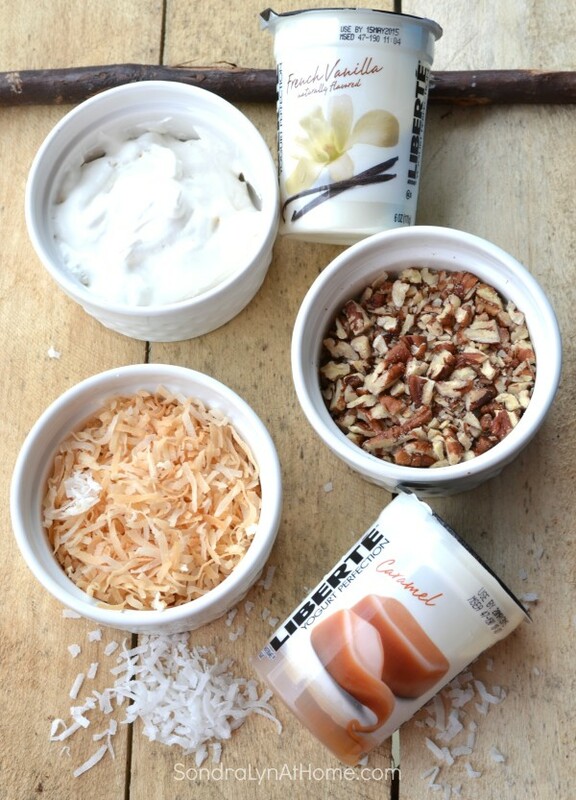 Vanilla yogurt, caramel yogurt, pecans then toasted coconut. Repeat layering and top with dollop of whipped topping. Oh, my goodness! I was amazed at how delicious this little impromptu dessert was. Y’all. This recipe makes 2 servings.. but I might’ve eaten it all (well, it was my lunch, after all). It’s like the best coconut cream pie you’ve ever tasted topped with the best macaroon cookie. 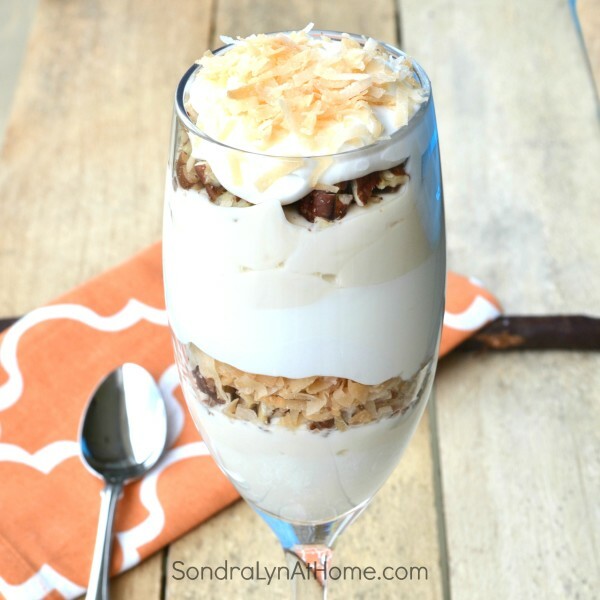 (I also might’ve kept adding toasted coconut and pecans as I got to the bottom… m’kay – TMI!) 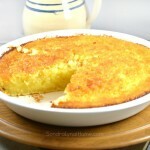 But for an after-dinner delight, this would be perfect for two, served in champagne flutes. How elegant is that? I hope you love this as much as we did! I would love to try the Méditerranée Cappuccino! It sounds amazing, I’ll definitely try this later! I will love to try Cappuccino flavor. I would like the Strawberry. I want to try the Peach & Passion Fruit flavor. Oh I would love to try the Méditerranée Blueberry first! They all sound so good! I want to try Méditerranée Cappuccino! The Méditerranée Caramel sounds amazing!! I think i would like to try the cappuccino. Méditerranée Coconut. Has milk sugar coconut and yogurt. I want to try the blueberry first! I want to try the Méditerranée Blackberry flavor first. Love the simplicity of the Méditerranée Strawberry. I love the caramel flavored one. Great post! I want to try the Méditerranée Blueberry first! I want to try the Méditerranée Cappuccino flavor. I would love to caramel!